The second-generation A8 (2003 - present) was built on Audi's D3 platform. The new A8 is longer than the previous generation, with room for four or five large adult occupants in the cabin depending on rear seat configuration. Two body variants of the second generation A8 are offered, the A8 and the long-wheelbase A8L. The A8L adds five inches of rear legroom. 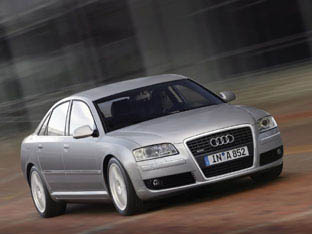 Audi restyled the D3 platform A8 range slightly in 2005, endowing all variants with a taller, wider single-frame grille inspired by that of the Audi Nuvolari concept car. The 6.0 litre W12 version of the A8 was the first model to be equipped with this grille, other versions were fitted with the new grille the following year. For the 2008 model year, the A8 received new electronic safety systems. "Audi Side Assist" detects cars in the A8's blind spots. And "Audi Lane Assist" warns when the driver starts to change lanes without signaling first.